I've been wanting to trace this image for a long time, way before my FMA "On Wings of Hope" wall because the style of the image suits a vector - flat colors, crisp lines, and I just love how ALL the shadows are the same black shade. Finally got around to doing the actual trace. The original image was vertical, with Ed's radiator behind Al, but who cares? This is a vector! I experimented with different placements and settled on having both of them surrounding the fire and sharing the warmth. The original junkyard had lots more, well, junk, but I eliminated most of that and focused just on the rocks and luggage so it gives the impression that they're camping. Everything in the image is a vector traced from the original except the soft glows (on the fire and moon) - yes, even the stars is vector scatter brush =3 The title comes from the first ending, from which the original image comes from, "Kesenai Tsumi" or "Indelible Sin" and is done in the same style as the title as "On Wings of Hope". I think indelible sounds cooler than unerasable. The word unerasable is such a mouthful. Indelible, now that's a nice one to roll off your tongue. EDIT: I made a parody doujinshi of this image a la comic book style, you can view it here. Hm. Yes, this image is splendid. I always wanted to wall it but never could do to my small cleaning and reCGing ablilites. You did an awesome job on this vector Tama. 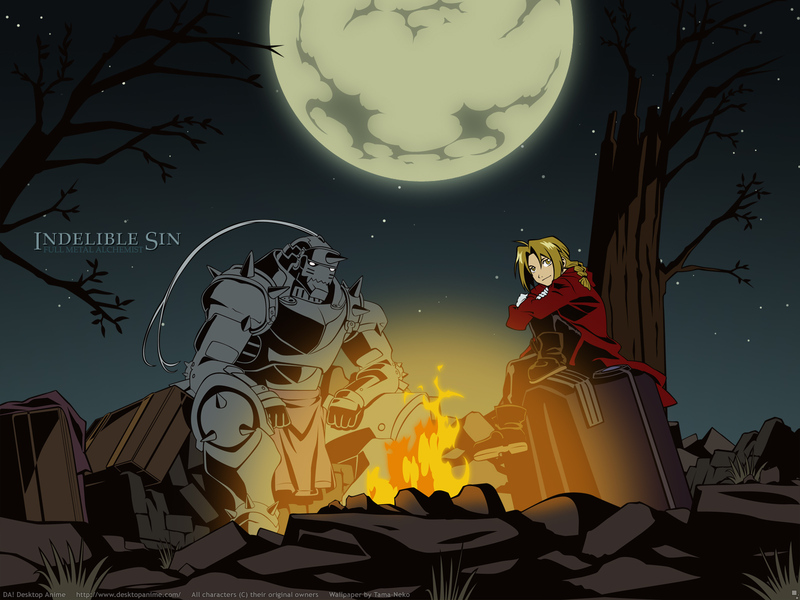 waah...Great Great...I didn't notice it that you've submitted a new FMA wallpaper ^^!!!! This is a great vector wall! An amazing wall form the vector diva!! When I saw the orginal image, the quality wasn't good but you pulled off a perfect vector wall!! fav. Anyways.. junkyard? :x I haven't seen FMA yet, so you very much fooled me for one. :sweat: It looks like a pretty camping scene (i love ed's expression XD looks a cross between cheeky, content and wistful. perfect for him). Extremely nice image for vectoring - the solid shadows look even better when totally solid. XD I don't know what else to say - it's a very pro wall, as your usual. :) Though maybe make the stars closer to the moon less opaque? *shrugs* XD +fav, in any case. Tama...I love you more than words can express right now. XD Will you have my children? (Wait, we're both girls..nm XD) I have wanted a vector wall of this exact scan for the longest time, but I just didn't have the guts to do it myself. This is just incredible, Tama the vector godess has stepped up to the plate again and provided us lesser mortals with a taste of heaven. Sorry if I'm delving into hyperbole, but this is seriously wonderful. Setting as wallpaper right away, and I wonder if I can print this as a poster for my room. XD Simply outstanding! Definitely the top wallpaper I've seen this week, and there's been a ton. Bravo. I love those rocks, the texture looks so smoodgily fun, love the shadows to0, simpleness at its best...but maybe the trees are a tad too dark around the top, I really couldnt see them untill I noticed the branch on the moon. tamachan - another uber vector job. took u a while to do it though xD .